Study of nearly 640,000 patients in last year of life reveals four distinct trajectories of care, but hospice constraints affected all. A woman is connected to hemodialysis treatment at Northwest Kidney Centers. In their last year of life, Medicare patients on chronic kidney dialysis generally follow one of four trajectories of healthcare expense and intensity, new research suggests. Those four distinct paths, however, share one trait: woefully poor access to hospice care. “Medicare’s lack of flexibility in providing hospice to these patients really stands out here. Whether there was a gradual or sudden increase in healthcare costs, it made little difference to their access to hospice,” said lead author Ann O’Hare, who with colleagues produced a paper (link, PDF) published today in the journal Health Affairs. O’Hare is a professor of medicine at the University of Washington School of Medicine. O’Hare is a professor of medicine at the University of Washington School of Medicine and a physician-scientist at the Kidney Research Institute, a collaboration of Northwest Kidney Centers and UW Medicine. Just last month she co-authored a paper which showed that, on average, Medicare patients on hemodialysis have significantly shorter hospice stays than other Medicare beneficiaries. Previous studies have shown that patients on chronic dialysis get intensive, costly care right up until death in terms of hospitalization and invasive procedures. In this study the researchers sought to learn whether different patterns of care exist within this population of Medicare patients during their last year of life. The study cohort, drawn from a national registry of end-stage renal disease, included nearly 640,000 patients ages 18-100 who had died between 2000 and 2014. The researchers used trajectory modeling, a statistical technique that identifies distinct groups of individuals within a population that follow different paths to the same endpoint – in this case, death. The groups’ differentiating measure was total Medicare Parts A and B costs, which O’Hare considers a rough proxy for patients’ illness trajectories. The approach discovered four distinct groups, the scientists wrote. Group 1 (9 percent) had escalating spending during all four quarters. Group 2 (41 percent) had relatively low spending for three quarters, with escalation in the last quarter. Group 3 (37 percent) had moderate spending for three quarters, with escalation in the last quarter. Group 4 (13 percent) had persistently high spending during all four quarters. “What was striking is that, despite the marked heterogeneity across the groups – in spending, use of acute and subacute care, and patient characteristics – it made little difference to whether patients were enrolled in hospice and how long they received hospice services,” O’Hare said. For all groups, fewer than one in four patients enrolled in hospice, quite low compared with the almost 50 percent hospice-enrollment rate of Medicare’s overall population. And in all four groups, patients spent a median of five to six days in hospice, far less than other Medicare beneficiaries. This didn’t necessarily surprise the researchers, though: Medicare policy currently provides for coverage of hospice care only after patients discontinue curative treatment for their primary diagnosis. For most people with end-stage kidney disease, that means stopping dialysis. This requirement likely discourages hospice use among these patients, O’Hare said, and shortens the duration of hospice care they might receive, no matter their illness trajectory. 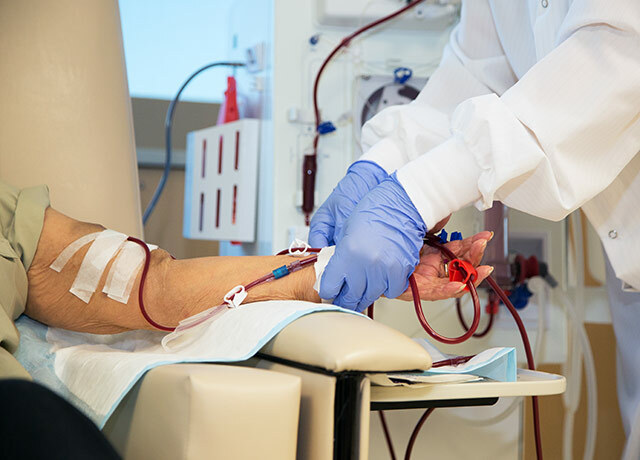 A small percentage of patients who receive dialysis treatment have another health condition that’s considered primary. A patient with lung cancer, for example, could end treatment for cancer but continue dialysis and receive hospice services simultaneously under Medicare. There are prospects for change. The Center for Medicare and Medicaid Innovation is testing several care models that might be adapted to more flexibly provide hospice and palliative care for patients on dialysis, O’Hare said. There are prospects for change. The Center for Medicare and Medicaid Innovation is testing several care models that might be adapted to provide more flexibility in the provision of hospice and palliative care for patients on dialysis, O’Hare said. The study was supported by the National Institute of Diabetes and Digestive and Kidney Diseases (U01DK102150) and by a private donation from Jeff Lehman and Katrina Russell.